[pwgt,pbuy,psell] = estimateFrontier(obj) estimates the specified number of optimal portfolios on the efficient frontier for Portfolio, PortfolioCVaR, or PortfolioMAD objects. For details on the respective workflows when using these different objects, see Portfolio Object Workflow, PortfolioCVaR Object Workflow, and PortfolioMAD Object Workflow. [pwgt,pbuy,psell] = estimateFrontier(obj,NumPorts) estimates the specified number of optimal portfolios on the efficient frontier with an additional option specified for NumPorts. Create a Portfolio object for 12 stocks based on CAPMuniverse.mat. Use setMinMaxNumAssets to define a maximum number of 3 assets. Use setBounds to define a lower and upper bound and a BoundType of 'Conditional'. The following table shows that the optimized allocations only have maximum 3 assets invested, and small positions less than 0.1 are avoided. The estimateFrontier function uses the MINLP solver to solve this problem. Use the setSolverMINLP function to configure the SolverType and options. 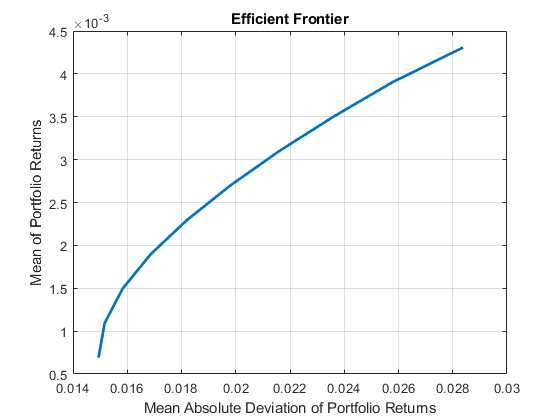 Obtain the default number of efficient portfolios over the entire range of the efficient frontier. 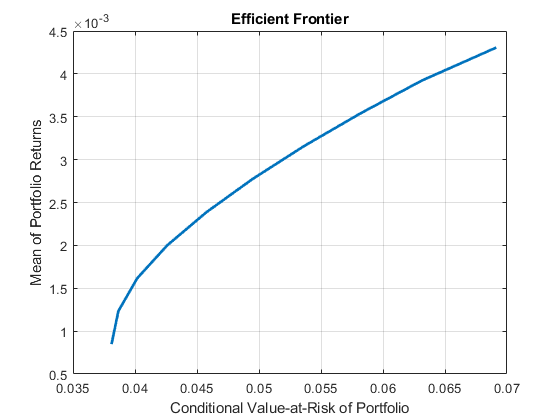 Starting from the initial portfolio, the estimateFrontier function returns purchases and sales to get from your initial portfolio to each efficient portfolio on the efficient frontier. Given an initial portfolio in pwgt0, you can obtain purchases and sales. Number of points to obtain on the efficient frontier, specified as a scalar integer. If no value is specified for NumPorts, the default value is obtained from the hidden property defaultNumPorts (default value is 10). If NumPorts = 1, this function returns the portfolio specified by the hidden property defaultFrontierLimit (current default value is 'min'). 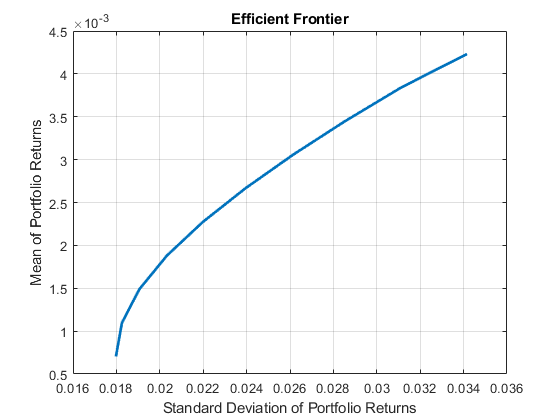 Optimal portfolios on the efficient frontier with specified number of portfolios spaced equally from minimum to maximum portfolio return, returned as a NumAssets-by-NumPorts matrix. pwgt is returned for a Portfolio, PortfolioCVaR, or PortfolioMAD input object (obj). You can also use dot notation to estimate the specified number of optimal portfolios over the entire efficient frontier. When introducing transaction costs and turnover constraints to the Portfolio, PortfolioCVaR, or PortfolioMAD object, the portfolio optimization objective contains a term with an absolute value. For more information on how Financial Toolbox™ handles such cases algorithmically, see References. Cornuejols, G., and R. Tutuncu. Optimization Methods in Finance. Cambridge University Press, 2007.